Clarity Wave is a cloud-based software solution that provides a unique employee experience using true 360˚ employee surveys. At first glance, Clarity Wave is a survey and feedback software. Like other employee engagement solutions, Clarity Wave allows team members to evaluate the company on a multitude of metrics. Unlike any other software, with Clarity Wave each team member has their own personal page that allows them to evaluate their co-workers and receive and provide feedback like never before. Clarity Wave is an interactive, dynamic and fun system that gives the employee an invaluable, in-depth analysis of themselves based on how they are perceived by their co-workers. The surveys are 100% anonymous. Users know what their co-workers are saying about them but NEVER who is saying it. This allows all team members to really express what is on their mind without fear of any retribution. 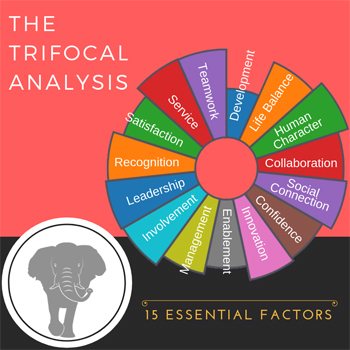 Our surveys gather data, not only about your company, but also about each employee, allowing you to see powerful individual analysis on how your team members perceive each other within the organization. Every team member has access to their own scores and can easily track their progress. Clarity Wave automatically lets users know if they need to pay attention to a particular area and assists them with tools to improve. Our SOS (Simple Objective Solutions) in the form of learning materials (videos and PDFs) provide help to employees on their journey of self-improvement. With Clarity Wave, every employee can give feedback, recognition and rewards to anyone in the organization. We created an organic, dynamic and fun way for people to interact with each other within the company. Employees can easily celebrate the success of others. And with the Clarity Wave Store, we reward the participation of your team members through a self-managed prize store that fits every budget and organizational needs. With Clarity Wave, you can easily see the overall mood of your business by knowing how happy people are and how they perceive their organization’s climate. Follow the daily trend lines of your team members’ moods in these two areas, and you can easily assess if the actions you are taking are having the desired effects. To really understand any situation, you need more than one side of the story. 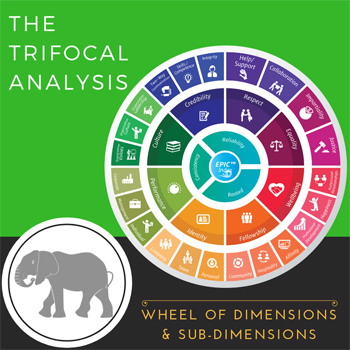 Each of our weekly questions is measured from 3 different viewpoints in what we call the Clarity Wave Trifocal Analysis, which gives you 3 ways of looking at each question and issue. You cannot change what you don't know, right? There's an ancient parable called "The Blind Men and the Elephant" in which a group of blind men, who have never come across an elephant learn what the elephant is like by touching it. Each blind man feels a different part of the elephant body, but only one part, such as the tail or the tusk. They then describe the elephant based on their partial experience and their descriptions are in complete disagreement on what an elephant is. To really understand a situation, you need more than one side of the story. 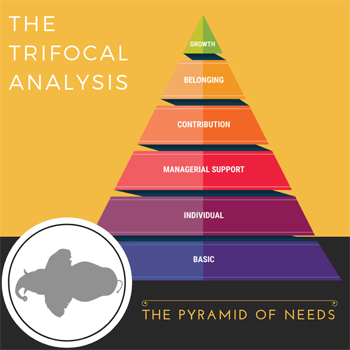 Each of our weekly questions is measured from 3 different viewpoints. Key culture dimensions from a company & employee perspective. How is Clarity Wave better than other workplace climate software? Why are the employee surveys weekly? Don’t team members get tired? On the contrary! Because each week the employee survey questions are different AND because the questions are about people they work with*, team members look forward to answering the surveys. Besides, by making the system weekly, there’s a feeling of constant growth and improvement that permeates the whole corporate culture. Yes! 100% anonymous. We only reveal the scores of a dimension after a certain number of answers have been accumulated, thus not allowing for users to guess who scored them. People know “what” was said but not“who” said it. How long does it take to answer each employee survey? Each micro survey is only 7 to 10 questions long and users don’t need to write anything. So all it takes is between 2 and 5 minutes. Can team members answer the employee surveys on their phones? Absolutely! Clarity Wave is fully responsive and designed to be used on the go. Just don’t use it while driving. What do I need to do? How much extra work will implementing Clarity Wave mean for me? We do 99% of the work and you do the other 1%. Depending on the version you sign up for, we work closely with you to set the system up in a way that runs pretty much automatically. All you have to do is upload your employee database and we take care of the rest. Once Clarity Wave is up and running we will help you set up the prize store which you will be able to manage with minimum time and effort. How does the Clarity Wave Store work? Do we have to pay for employee recognition prizes? Because we have clients all over the world, we have found that, the easiest way to manage the store is by providing our customers with a pre-loaded catalog of generic prizes. However, you have complete freedom to add, remove, edit, activate or deactivate your own prizes. We even provide you with a great calculator tool that allows you to set the value of the points earned throughout Clarity Wave to meet your own budget. This way, if you have a big budget, you can select more expensive prizes. However, we also provide you with some great prize ideas that are very effective in motivating your staff, yet cost your company almost nothing! 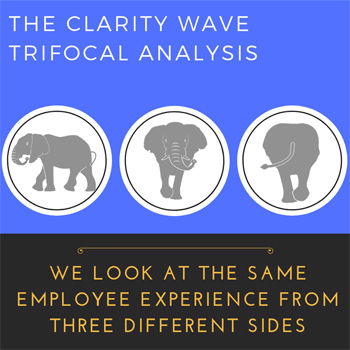 Is Clarity Wave for every kind of business? As powerful as it is, Clarity Wave is not a magic wand that will fill your business with rainbows and unicorns. Clarity Wave works best for companies that are already working consciously toward improving their organizational climate. We help you measure and pinpoint areas of opportunity, but you have to be willing to take action with the results that we uncover. Is Clarity Wave only in English?